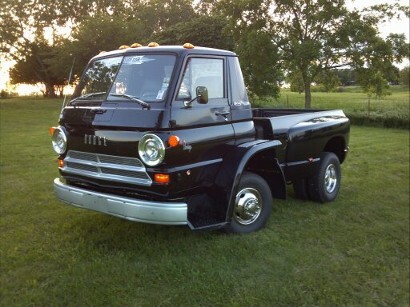 I had seen pictures of this type truck over the years, and had fooled around with the A-100's, but never saw one in real life till I went to a friends house. He had an old well used juice brake L-600 that had last been used as a tear off truck for some roofer. You know, just got old enough that you could use it around here and there for odd jobs, or to throw shingles in when you are roofing. Just has to make it to the job, then the dump and thats all. 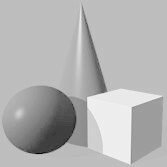 And that was pretty well the limits of its abilities. 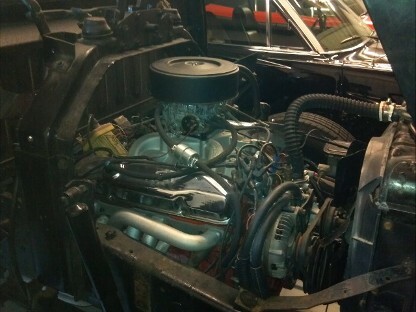 The lift cylinders and hydraulics for the bed worked, and was probably the best functioning of all the systems. He had planned on putting the cab on a later model motor home chassis, giving it a diesel and an Allison automatic, as well as all the other newer features of a 90's motorhome. For a bed, a rollback would be the hot ticket. This guy had more on his plate than any 3 men could accomplish in a lifetime. Sounded like a good plan but I doubted that it would go to the top of the 'to do' list in our lifetime, so I asked to be put on the call list if anything didn't pan out. 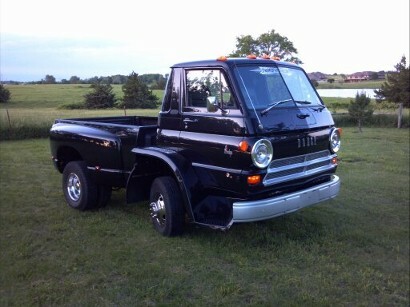 About a year later he called and I accepted the opportunity to purchase the truck--if he would bring it to me. That he did, on a standard 18' car trailer that was wheezing when he got here. It was a run of the mill cab and chassis when new, 318 2bbl, 4 speed, 2 speed rear end with 580/810 gears, ancient 20" tires and wheels, remote vacuum hydraulic brakes and a 16' dump flat bed. It was a typical grain truck from the 60's. 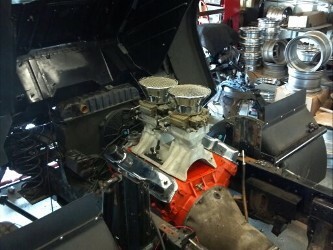 The engine was tired and needed a set of heads, as well as a shop rag removed from the oil pan to run right. 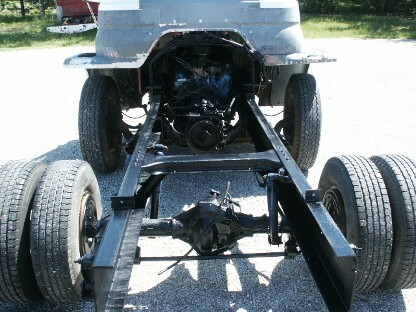 The bed and hoist was removed and the truck sat half nekkid for a while awaiting the correct 'inspiration'. Couldn't come up with the right plan without looking at it for a while without the bed on it. A couple months and a few beers later, I came across a new take-off '09 Dodge diesel dually bed that was removed minutes after the truck was bought in favor of a bale bed. Price was right, all the parts were there, and besides, I had a good Dana 70 dually rear end with 354 gears just waiting for a project. It would also be the basis for the color as it didnt need repainted. A plan was starting to form. Pulled the truck in the shop, lifted up the rear of the frame with an overhead hoist, cut the 2 speed Eaton rear and springs out and rolled the Dana with springs and perches right under it. The frame rails were the same width as the 1-ton. 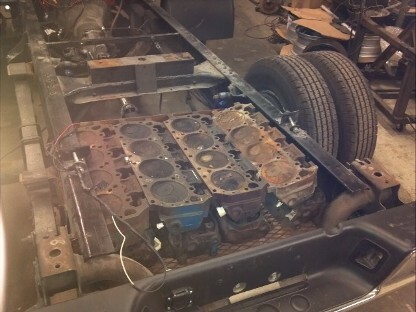 Previously, the bed was fitted on the frame to size up where it needed to sit, thus finding where the wheelwells and center of the axel would sit. 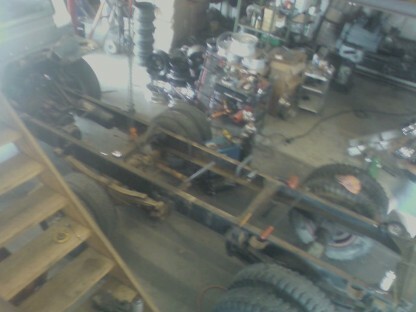 Perches were welded on and the remaining 7-1/2' overhang behind the axel was cut off. Next great find was a 78 Winnebago with a 440 and front disc brakes. Got the front clip from it which was basically everything from the trans mount forward. 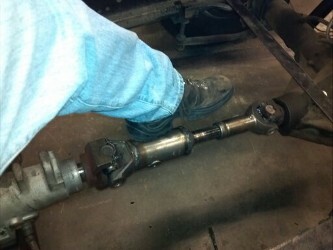 This is where the straight axel with disc brakes and sway bar came from. Another case of cutting out the old set up and rolling the new one in its place and again, the frame width was the same between the Winnie and the L-600. 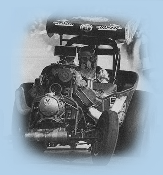 Now that the platform was all set up with conventional front and rear ends, a new set of 16" tires and simulators went on, brake system was changed to a standard master cylinder set up (manual), and the 318 was back to running as good as it would, so put on a set of shorty headers and ran dual exhaust out the back. 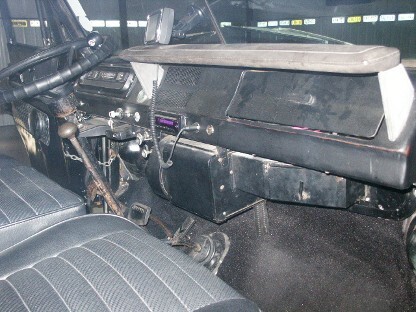 Gutted what little interior there was, removed the wiring harness and had the cab soda blasted. 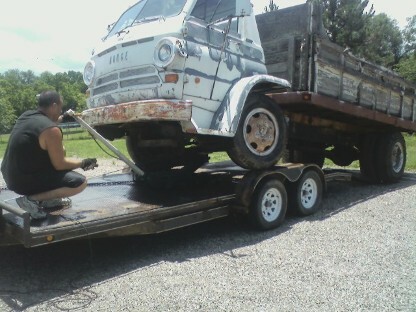 Due to the fact that these trucks were 99% galvanized, there was no rust to speak of, and very few dents. 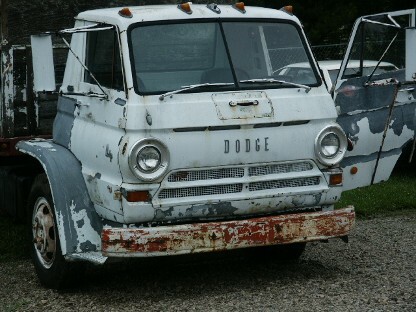 The cab was then painted chassis black on the inside and 99 Dodge truck black outside. The cab was fully insulated and carpeted, a pair of jeep seats recovered and the wiring harness was checked/repaired and reinstalled. LED lights and bulbs went back in to increase visibility and create less stress on the wiring, and a tach was added to the instruments. Factory vacuum and oil pressure gauges still remain and work. 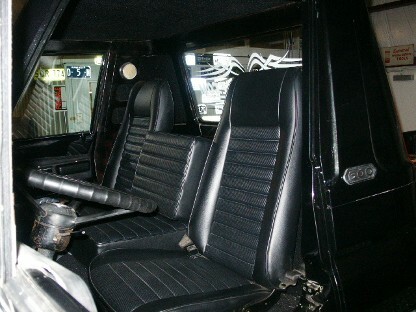 Added a Pioneer AM/FM/CD/MP3 with 2-6" speakers in the doors and 2-6x9's in the rear storage area behind the seats. You never have enough 'power points' in a truck so put in 3 lighters. Found a 68 A-100/van passengers dash pad on pedestal and put that in just for good measure. Just needed a fuel source, as the old square tank wouldnt fit where it used to. 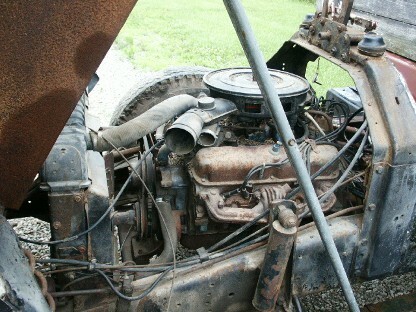 The 1-ton that gave up the rear end also had a 60 gallon bus tank in the bed, so it went into the bed of this one. Fills from the front edge of the bed without lifting the cab. So its all together and running. Got a truck that will run down the road at 70 MPH, 6000 pounds on a 1-ton suspension rides like a dream. With a 79" wheelbase it will turn a full circle inside of a 2 lane road. Manual steering is a little difficult till it gets rolling but you get used to it and pick your fights accordingly. Loaded it up with a thousand pounds of swap meet goodies and took off to Indy for the Monster Mopar show and made it with no problems. Best part of that trip was cruising through the show field and watching people looking at Superbirds turn around and wipe their asses on it to watch the truck go by. Guaranteed, it will be the only one anywhere you go. 7000 pounds hurling down the interstate at 80MPH was good for 10MPG with the 318, but it was a struggle to keep up with traffic, and was utterly gutless with a trailer behind it. Something needed changed. Long story short, it ended up with a 70 440HP unstamped warranty engine, 906 heads Edelbrock intake and carb, long tube headers and electronic ignition. The super short 727 from the Winnebago was rebuilt and used, fortunately, as there was only enough room for a 4" long driveshaft. Also noticed previously, that the truck tended to be a bit nose heavy. 6200 pound truck with 4500 of it on the front axel may be a factor. So a tray was added behind the rear end between the framerails for ballast. 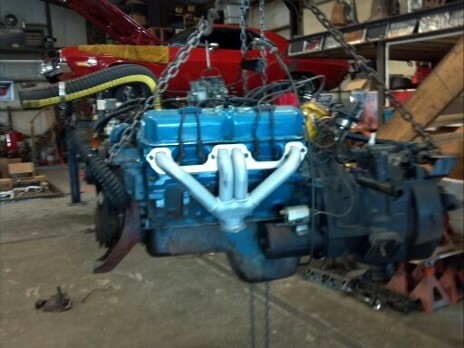 It has 8 big block cylinder heads sitting in it for weight, and it helps, but needs more. A Gooseneck ball and hitch was added for pulling a bigger trailer. Trans cooler is a full sized a/c condensor mounted under the bed side with its own fan. Still runs and drives great but tends to heat up when the outside temp is above 60.